The team from OCLC Research which is developing a new action-oriented agenda on library contributions to student learning and success has released a second draft (PDF). Team members seek your input and reactions via the feedback form by February 17, 2017. Learn about the team’s continued progress and next steps during ACRL’s Update on the Value of Academic Libraries Initiative at ALA Midwinter meeting on Sunday, January 22, 2017, 1:00 PM – 2:30 pm. 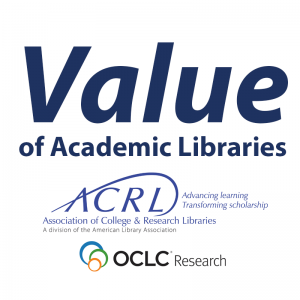 In this session, join ACRL’s Value of Academic Libraries committee chair to hear the context for this work along with OCLC Research’s project director and project team members. Ask questions and give your feedback on the second draft. Find out more about the scope of the agenda and background on the project website or by watching the recording of a November ACRL online forum. Book editors are seeking chapter proposals for a book on library assessment. Please consider sharing your work in this area to this effort. As the ACRL liaison to the Council of Independent Colleges (CIC), I attend CIC’s annual Institute for Chief Academic Officers. CIC is a major national service organization for small and mid-sized, independent, liberal arts colleges and universities in the U.S. CIC focuses on providing programs and services that assist member institutions in improving educational offerings, administrative and financial performance, and institutional visibility. The theme for the 2016 Institute was “New Realities, New Solutions”. My session was titled “Academic Libraries and High-Impact Educational Practices”. Higher education institutions are increasingly being asked to demonstrate their value and to assess defined outcomes. As small and mid-sized, independent, liberal arts colleges and universities, CIC members are positioned to offer programming, resources, and services that are student-focused and incorporate high-impact practices. 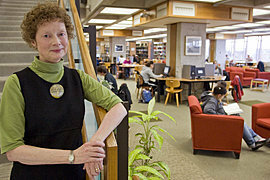 Using George Kuh’s High-Impact Educational Practices (AAC&U), I highlighted ways in which academic libraries, as key contributors to holistic student success, are actively engaged in high-impact practices and shared strategies for fostering high-impact practices, including campus partnerships, student engagement, support for student academic success, co-curricular success, and personal development. I also discussed approaches for engaging faculty in high-impact practices via library-based activities. As at previous institutes, I found the deans and provosts to be very interested in the library’s contribution to student success. I provided a handout with links to selected CIC-member projects from ACRL’s Assessment in Action (AiA) initiative. I also offered a breakfast session on ACRL’s 2016 Top Trends for Academic Libraries and provided a handout with links to selected resources from the report. Session attendees had questions about library staffing, library leadership, and space planning/renovations. I attended a roundtable discussion on collaborative space planning/exploration. Academic libraries were frequently mentioned as targets for collaboration in terms of evolving services, co-location of student and faculty support services, and student-centered spaces. As a result of the Institute, one library is sending staff to visit my library and I will be working with additional libraries via on-site visits.